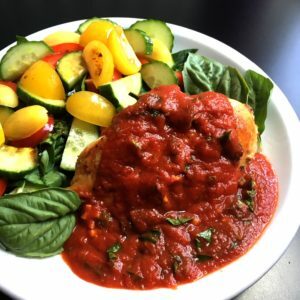 This is a quick, easy recipe that I use this in lots of different ways – over pasta, over pan-fried chicken, with meatballs, with spiralized vegetables – and it always hits the spot. It also keeps well in the fridge, so it makes a great lunch out of the leftovers. If you leave out the butter, it’s also Whole30 compliant! 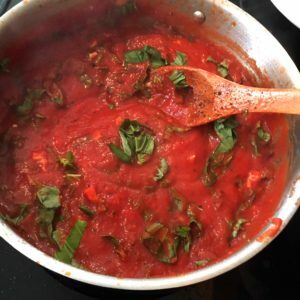 For more delicious recipes, click this link! Heat olive oil in a heavy skillet at a medium heat. Return to a medium heat and simmer tomatoes. Add garlic, butter, salt, pepper, and chili flakes if desired; cook for an additional 5-10 minutes. Just before serving, stir in basil.